Spring time equals Spring cleaning in my house. Every year, we go through the entire house and spruce it up a little bit, from top to bottom. It is the time to wash away all the negative from those dark cold months of Winter, but it also gives you a chance to really reflect on what you want to do in this time of re-birth. Spring delivers a time where the simplest changes can leave you feeling anew and refreshed. Over the course of the week I am going to introduce some new techniques to turn your Spring cleaning venture into a simple, green, family centered experience. Because let's be honest, you aren't going to tackle everything on your own. Make it a family affair. Before you decide to divide and conquer, take some time to acknowledge the types of products you are going to be using during your Spring cleaning. Listed below are recipes to create your own household cleaning items; these items are safe, easy on your pocket, and a fun science experiment that you and your family can make together! These recipes can help you tackle anything in the house in a safe, frugal, and green manner. Know what products are being sprayed in your house. Taking a green approach to cleaning products will help alleviate any concerns you have with spraying toxic items in and around your house. 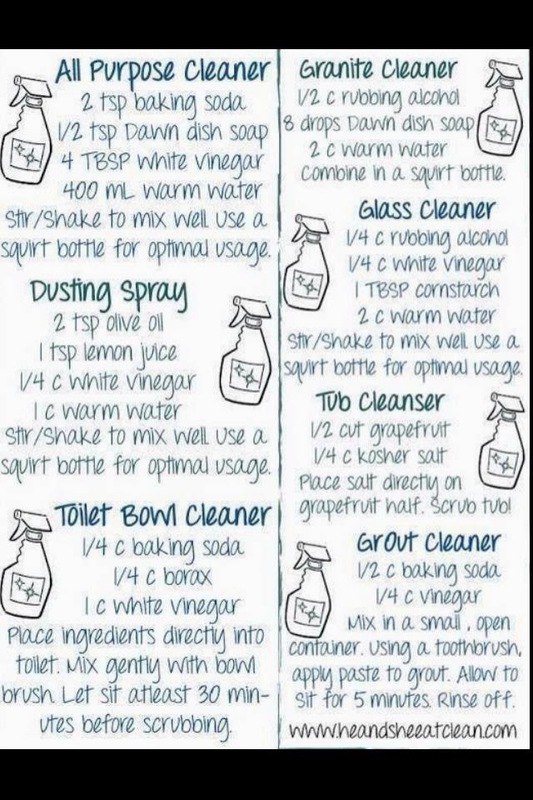 Vinegar is used in all of these products, (my least favorite smelling component) but if you are like me and loathe the smell of vinegar I have a little trick that will help with the smell. With the help of numerous essential oils: rosemary, tea tree, eucalyptus, lemon, orange, you can bring the smells of your newly planted garden into your home. All of these oils are safe to mix with these recipes. A few drops will do the trick. Find any essential oil you need at Mountain Rose Herbs. These are some really good DIY products for cleaning, since they are very easy to make, and the ingredients can be easily found in your own kitchen. Well, thanks for sharing this with us, Jodi. I hope a lot of your readers would find this useful. Cheers!